This is what you're going to have by the end of today! Are you excited? Looks like something you'd see in Modcloth. I just needed an excuse to document the lovely azalea bushes in front of our home. They only look that good for about two weeks out of the year. Yikes, I have to do some weeding! Actually, those are 90% herbs but they really don't look good in the front flower bed. Sadly, I think I'm going to have to dig them up this year:( Okay, I'm digressing. Let's go! 1. Sew the zipper on. This will be tricky for those of you who have never sewn a zipper in. I used an invisible zipper but if you only have a regular one that’s fine too. Just be sure that it reaches several inches past your waist hem so that it can fit over your hips. Match the zipper to the edge of the fabric as shown in photo to left. The back of the zipper is face up and the front of the zipper is against the right side (by ‘right side’ I mean top side of fabric) of the bodice. If you need to use pins, pin to bodice, but you must remove these as you sew. You cannot leave them in. If you have a zipper foot. Use it. If you don’t you can still sew on the zipper but it might not be quite as neat. Keep your presser foot to the side of the edge of the zipper as shown in the photo to the left. If you only have a normal foot the zipper will have to move under the foot. Just go very slowly. The key is to stitch as close to the zipper as possible without catching any of the teeth of the zipper. If you do catch the teeth, take out your garment, rip out the last few stitches you made and begin where you left off. If you catch the teeth even ONCE the zipper won’t work. 2. Stitch the zipper until you get about two or three inches from the bottom and stop. 4. Find the end of your stitches. 5. Begin sewing at the end of your stitches down to the bottom of the skirt. 6. Zipper should now look like this. If you don’t want your loose strings to get stuck in the zipper, serge or zigzag stitch the material around the zipper. 8. Serge or zigzag stitch the bottom of the skirt. 9. Fold over ½” for hem and stitch. 10. For those super daring you can try the ‘blind hem’. I won’t go into that now because I think it’s a more intermediate finish but if you’d like to try here is a good instructional video. It does look a lot nicer in the end. Can you believe it? You did it! I hope it wasn’t as hard as you thought it would be. Please post your finished work to Grosgrain Flickr! I'm so excited to see what fabrics you used, if you tried sleeves, how it looks on! I will be doing a post next week featuring all the people who posted their dress! Wonderful!! !I love this version of the dress. I hope I will be able to finich to night! I am going to a wedding tomorrow morning and was in need of a good classic dress. Thank you. Seriously so CUTE! I love it! I'm confused about step 5. Are you sewing from the bottom of the zipper back up to the top of it where you started sewing the other side of the zipper? Or are you starting back at the top again and going down toward the skirt like you did for the first side? But to elaborate myself- Zip up your zipper. Keep dress inside out. Now, where you left off with the zipper (about two inches from the bottom of the zipper) sew down to the hem so that you are sewing the back together. Better than ModCloth! It's gorgeous. I love the colors you chose. Wish I could sew. So CUTE!!! This was a lot of fun! Thanks! I just posted to the Flickr group! I think I'm the first???? Maybe cuz I didn't have to do a zipper? I'm done!!! Yay! My dress seems a little bit big though. A little loose all the way around, but this was a practice dress. Is there a way to make it fit better though? Can I stitch down the side seams or is it too late for that? For my "real dress" would you suggest going down a size or just adjusting the side seam allowances on the current size? I'll be taking and posting pictures tomorrow! I'm so proud of myself! i tried to upload a pic to flickr but it didnt work. i loved this project! it turned out great. i did1 it in blue sear sucker.thanks for all your hard work! are you going to do a frock by friday again?! i hope so! Sure, you can take it in on the sides. I would definitely recommend that. The only thing you might want to watch is the armholes. Just don't take them in too much. You can start by taking it in smaller at the armholes and gradually get wider at the waist and then taper at the skirt. For your real dress I would take it in a size. Thanks Kathleen! This was such a fun project! What a boost to my sewing confidence! Your dress looks great! I love the fabrics you chose. I'm not finished mine yet. I got it to fit ok with the zipper, so I just have to finish sewing the back seam and do the hem. I do have one fit issue...because I took off four inches from the back it pulled the straps closer together at the back, causing the front of the neckline to tilt out a little. It actually looks a little interesting. Other than fiddling with the side seams, is there anything I can do to make that a feature instead of a flaw? I don't have the ruffle, due to a lack of fabric. Great dress! I love that you did this project. It's sooo helpful to see pictures and have good instructions. I hope you do it again, I would love to follow along. I love your dress. I've often looked longingly at your creations and wished I could make my own clothes. The coffee date dress looks like a great first step in that direction. I didn't have time to sew along this week but I really want to make a coffee date dress somewhere in the next weeks. I think I'm going to steal your three color idea, it's so nice. I just took my measurements (or actually, I started taking my measurements, I stopped after measuring my hips) And my bust and waist measurement are exactly a size 36 , but my hips are 84.5 centimeters, which is smaller even than a size 34. Would the dress fit if I just made it in size 36? If we do this in two different fabrics how much yardage would we need for the top and the bottom? I would go by your bust and hips since this is mostly fitted in those areas. Your hips are really secondary in this pattern because it's a loose skirt and not fitted slacks. For the bottom, I bought one yard but it was a little too little. I'd get a yard and 1/4" to be on the safe side. For the top I also got a yard. Well, that's a tough one but I'll try....you could pinch the top of the neckline and add darts at the top of the bust. I finished mine and I am wearing it on my birthday tomorrow to church. Will have my family take pics and I will post to flickr. Love the fit of the dress, but the darts in the front are a bit funny and my first invisible zipper is a bit visible. Overall though I love the dress and that I got it done in a week! I am done except for the hem! I second the comment about my invisible zipper being a bit visible, (and I think my tension was a bit off, so the seam isn't very tight). One other thing, is that my waistband isn't perfectly lined up in the back... I think it happened some time during the zipper attachment. Do you have a tip on preventing that next time? Thanks again for doing this! I hope you do it again; otherwise I'll be making this dress over and over with different variations! My waistband was not perfectly matched either. But that is a simple problem to fix ahead of time. When you're sewing the skirt to the bodice, pin it and then line the two back sides together to make sure that the waistband or the seams match up correctly. If they are a little bit off, adjust by making more or less allowance on one side of the waistband. It really reduces the amount of hand and eye coordination needed. In google, type in the brand of your sewing machine and the words "invisible zipper foot" in quotes. Something should come up. That was so much fun, can't wait to see what project you come up with next! I had my fabric for ages and this seemed like the perfect dress to sew with it. Loved your step by step photos. Love your finished dress, it is darling on you. I have posted my pics (Darby1412) and can't wait to see everyone's creations. I left a post on the "corresponding date" of where I am at....catch up....story of my life :). You INSPIRE ME which equals staying up late. Should we cut a seam allowance around the dart lines? It appears they then wont be narrow enough. Yes, do a seam allowance around the darts. wow...isn't this a burda style pattern???? Hello - I am making this dress for the second time. It's actually going to be a bridesmaids dress for my friends wedding. Its coming along good. Im doing 2 things a little different; im doig a full lining for the top and i bought lace to make little ruffle sleeves. But now im running into a big problem, I realized i have no idea how to put on the sleeves since the facing is sewd on before the shoulders are sewed together so i dont know how to put in the lace! Any suggestions?? I would suggest to leave the shoulder seams unsewn and raw. Then when you sew the lace on use a French Seam so that the raw edges don't show. Thank you for the suggestions! I love french seams I actually tried them for the first time on the skirt sides and they're great! Im still a little confused though... how would i attach the lace sleeve if the shoulder straps arnt sewn together yet? They should still be sewn together at the neckline seams which would include the inside (right and left sides) of the straps. Does that make sense? If you are confused just let me know. I'll try to make a video or draw a diagram. 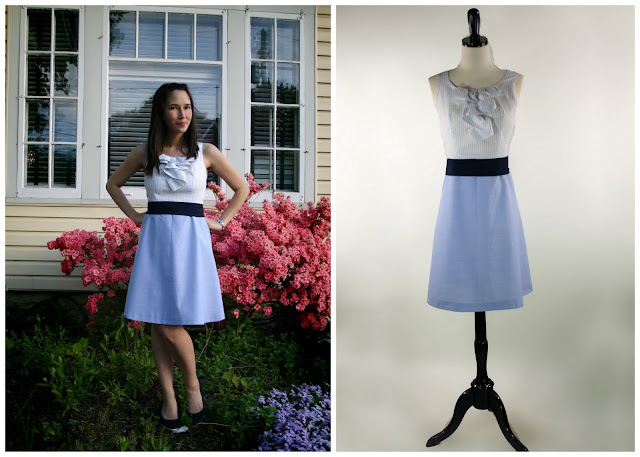 Do you have any good tips for hemming a dress like this? I had quite a time trying to hem it because of the curve of the skirt.